The operation codenamed “Fast and Furious” remains a hot topic in Washington two years after it went awry. Conducted by the Bureau of Alcohol, Tobacco and Firearms and Explosives (ATF), the operation was intended to monitor the flow of weapons – through a “controlled delivery” – from Arizona gun dealers into the illegal channels by which tens of thousands of arms clandestinely enter Mexico each year. Tracking the arms would allow the U.S. Government to disrupt the network. However, ATF lost track of the weapons – and they reached their intended buyers. The failure was made worse when traces showed that two of the weapons were used to kill a U.S. Border Patrol agent near the Mexican border in December 2010. 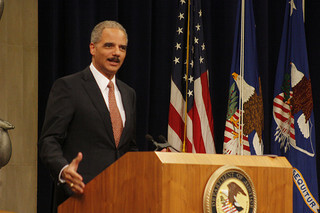 While both political parties in Washington have expressed disappointment, the Republicans have made the failed operation the centerpiece of efforts to weaken Attorney General Eric Holder (ATF is an agency of the Department of Justice, over which the Attorney General presides) and to discredit President Obama, according to numerous press reports. The vote in the House of Representatives last week [[June 28]]to find Holder “in contempt” – for not handing over all of ATF’s internal documents on Fast and Furious that the Republicans demanded – was a party-line vote. Many Democrats walked out of the chamber. The political maneuvering around Fast and Furious has nothing to do with foreign policy, but the weakening of ATF undermines what modest efforts were under way to stanch the flow of illicit arms into Mexico and Central America. “Controlled deliveries” are a standard operation for intelligence and law-enforcement agencies, and every agency involved in border issues has suffered similar mistakes. ATF is the smallest such agency (2,500 special agents compared to FBI’s 13,400 and DEA’s 5,500) and is therefore more vulnerable to the internecine backstabbing. In addition, ATF’s enforcement of laws relating to the use, manufacture, and possession of firearms often puts it at odds with American politicians who feel the agency threatens their interpretation of the gun rights under the Second Amendment of the U.S. Constitution. The attacks on the ATF appear intended to weaken enforcement of U.S. law and embarrass the Attorney General and the President. The obstacles to a sound policy of limiting the flow of weapons into Latin America are evidenced by the virulence of the debate over Fast and Furious.